We are thrilled to announced that our picture “A park in Weehawken, NJ” was featured on the New York Times. 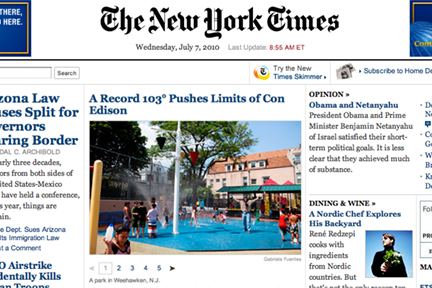 Yesterday, NY Times requested submissions of 2010 heat wave pictures. Danny and myself headed outside with the 103º heat, snapped a few pictures and submitted them. In my wildest dream could I have thought The New York Times was going to publish one of our pictures on the Front Page of their online early edition. So My Photo of the week is none other than “A park in Weehawken, NJ,” featured on the NY Times. The Wedding Central is a wedding photography and wedding video studio owned by Wedding Photographer and Wedding Videographer, Gaby and Danny, award winning storytellers. The studio is located right between Hudson and Bergen County, NJ, in the Hoboken Weehawken area and capturing weddings in Manhattan, NY, Northern New Jersey, Central NJ, Jersey Shore and the tri-state area.